Since the 3/11 compounded disasters, Japanese energy policy, especially its nuclear policy, has been paralyzed. After the Fukushima disasters, public opinion turned against nuclear energy while the central government continues to push for restarts of the many offline reactors. 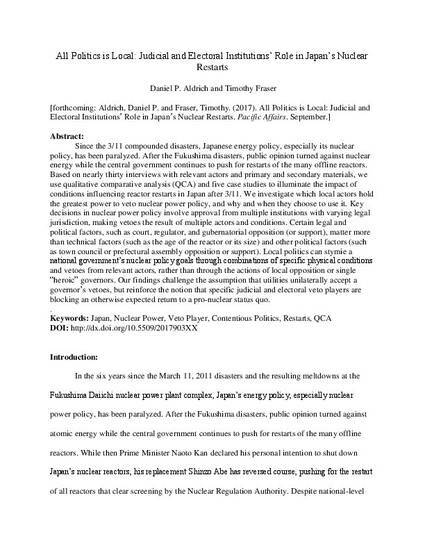 Based on nearly thirty interviews with relevant actors and primary and secondary materials, we use qualitative comparative analysis (QCA) and five case studies to illuminate the impact of conditions influencing reactor restarts in Japan after 3/11. We investigate which local actors hold the greatest power to veto nuclear power policy, and why and when they choose to use it. Key decisions in nuclear power policy involve approval from multiple institutions with varying legal jurisdiction, making vetoes the result of multiple actors and conditions. Certain legal and political factors, such as court, regulator, and gubernatorial opposition (or support), matter more than technical factors (such as the age of the reactor or its size) and other political factors (such as town council or prefectural assembly opposition or support). Local politics can stymie a national government’s nuclear policy goals through combinations of specific physical conditions and vetoes from relevant actors, rather than through the actions of local opposition or single “heroic” governors. Our findings challenge the assumption that utilities unilaterally accept a governor’s vetoes, but reinforce the notion that specific judicial and electoral veto players are blocking an otherwise expected return to a pro-nuclear status quo.